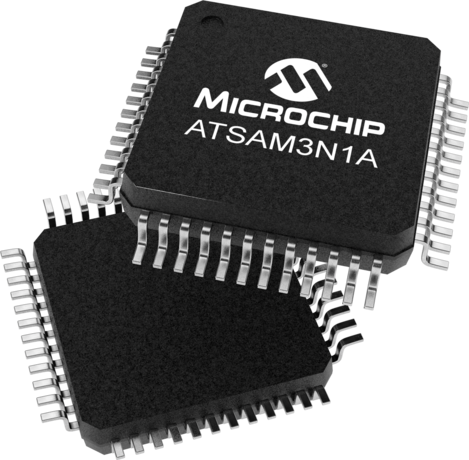 The Microchip's SAM3N1A is a member of the SAM3N series of microcontrollers based on the high-performance 32-bit ARM® Cortex®-M3 RISC processor. It operates at a maximum speed of 48MHz and features 64KB of flash memory and 8KB of SRAM. The peripheral set includes a USART, two UARTs, two SPIs, two TWIs (I2C), PWM timer, six 16-bit timers, RTC, and a 10-bit ADC. The SAM3N1A is ready for capacitive touch thanks to the Microchip QTouch?? library, offering an easy way to implement buttons, wheels, and sliders. It operates from 1.62V to 3.6V and is available in 48-pin LQFP and QFN packages. The SAM3N1A is pin-to-pin compatible with the SAM3S1A.